PMAV: Personal Micro Air Vehicle. 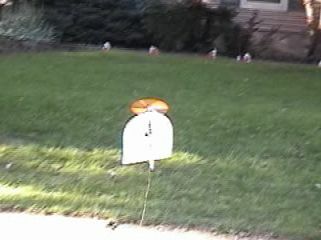 Fly it in your backyard. No prior experience required. The PMAV is very easy to build. It can be built from scratch by anyone in less than an hour (see plan and building instructions below). It is very easy to fly, even for total beginners. It is very sturdy, and practically unbreakable. 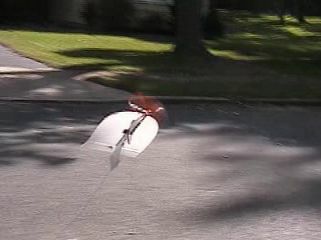 It is highly maneuverable and can even take off vertically. See pictures and videos below. 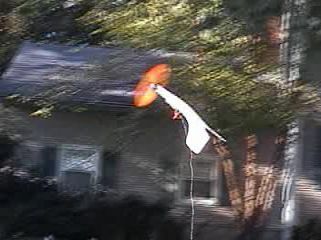 prop: GWS orange props: 6050 (beginners), 8043 (experienced pilots), or 9047 (experts, allows vertical takeoff). radio: GWS receiver with 2 GWS Pico servos. The PMAV control surfaces consist of an elevator and a rudder which is mounted on a downward-pointing tail fin (placed below the wing). 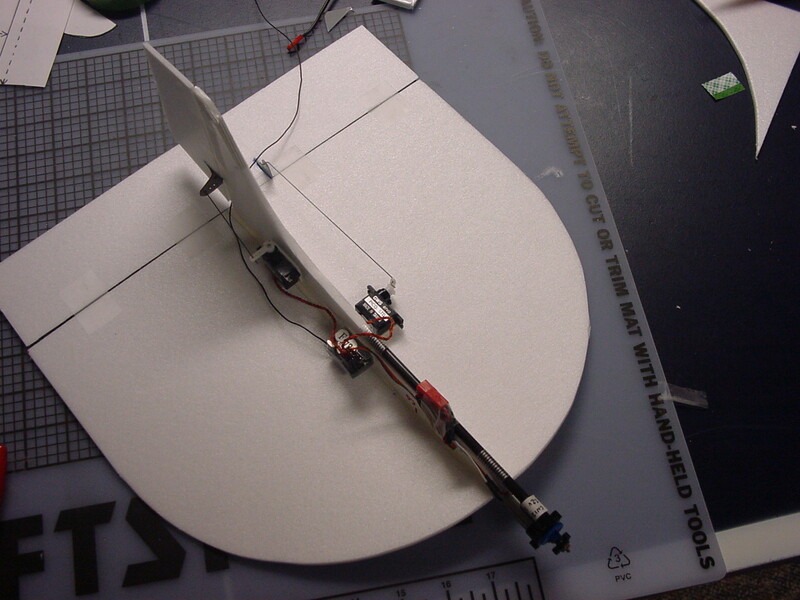 This configuration allows the PMAV to bank automatically while turning, without requiring ailerons. 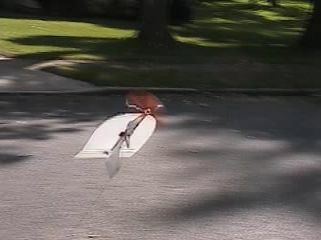 Unlike with traditional aileron-controlled airplanes, it is practically impossible to flip the PMAV upside down. 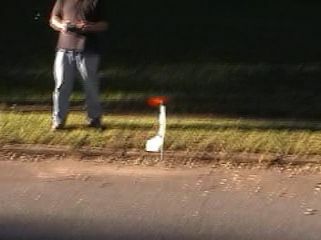 This makes the PMAV very easy to fly by children and beginner pilots. Its larger-than-one thrust to weight ratio and high maneuverability make it fun for expert pilots. 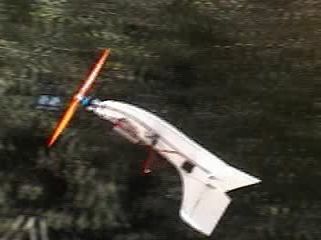 The low aspect ratio wing is compact and sturdy. 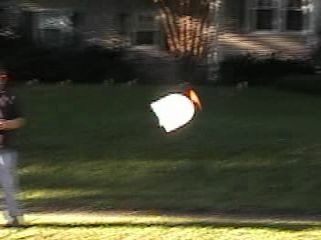 It also allows ultra-low-speed flight at very high angles of attack. The larger-than-one thrust to weight ratio allows vertical takeoffs and high-speed horizontal flights. The construction is fast, simple, and requires no glue (everything is held together with tape!). You can take the PMAV anywhere with you (on plane trips...). 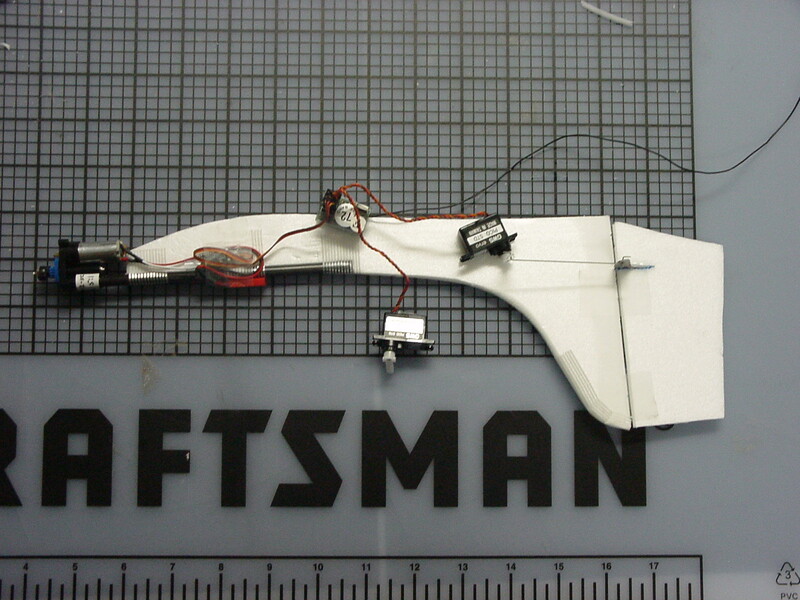 The wing and fuselage are held together with double-sided mounting tape and can easily be disassembled and reassembled. 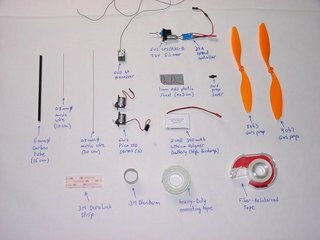 Here is a list of what you need to build the PMAV-320. A picture of all the items is shown here. Click on the links for high resolution versions of the picture in DjVu or JPEG. Carbon tube, diameter: 6mm, length: 150mm. The Depron can be obtained from hardware stores in many European countries, and from Depron USA in the US. The PMAV can also be built with Zepron, a Depron substitute sold by Air Dynamics in the US. to hold the battery: a strip of 3M DuraLock (a Velcro-like thingy made of hard plastic). This can be found at any hardware store. If you can't find DuraLock, use sticky Velcro pads. to make the hinges: a roll of 3M Blenderm, or any other surgical-type extensible tape that sticks well on Depron. 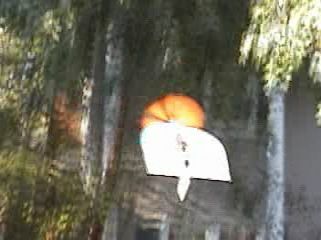 Blenderm can be obtained from Air Dynamics. to hold the motor mount to the fuselage: a roll of fiber-reinforced tape (available from any hardware store). to hold the wing to the fuselage: a roll of double-sided mounting tape (available from any hardware store). to hold the horns to the control surfaces: a roll of thin double-sided tape, or some foam-friendly (odorless) CA glue, or some 5-minute epoxy. Radio/Motor. All of this can be obtained from Balsa Products. Receiver, e.g. GWS 4P 4-channel receiver. 4 Amp motor speed controler, e.g. GWS controler, or a Castle Creation Pixie 7P. GWS orange propellers: 6050 (beginner pilot), 8043 (intermediate pilot), and 9047 (expert pilot). By a few, because you might break them. Lithium-Polymer Battery pack: 2 cells, 340mAh from Kokam. Other brands of LiPo batteries may be used as long as they can put out 5 Amps (e.g. Taisun 750mAh, E-TEC, I-RATE....). The plan consist of two sheets that can be printed on regular-sized paper (US-Letter size or A4). Each sheet is provided in two format: PNG and DjVu. I very strongly recommend that you use the DjVu version, because the DjVu viewer allows you to print the plan at real size. Downloading and installing the DjVu viewer takes only a minute. DjVu viewer for Windows or MacOS. DjVu viewer for Linux or Unix. To print the DjVu plan, bring up the DjVu version of the plan, and click on the printer icon in the DjVu window (do not select your browser's "print" menu). In the DjVu printing options, select "one-to-one" as the printing scale. 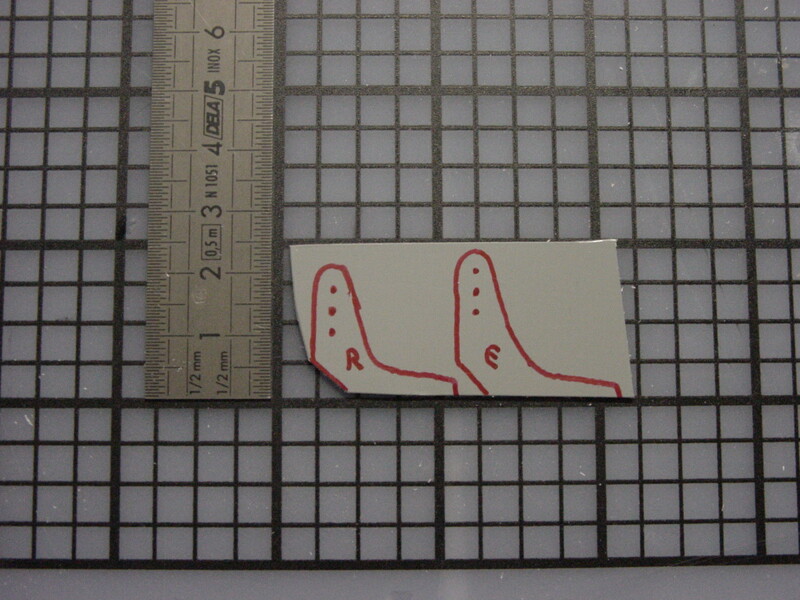 1: Cut the fuselage template from the plan and place it on the 6mm Depron sheet. 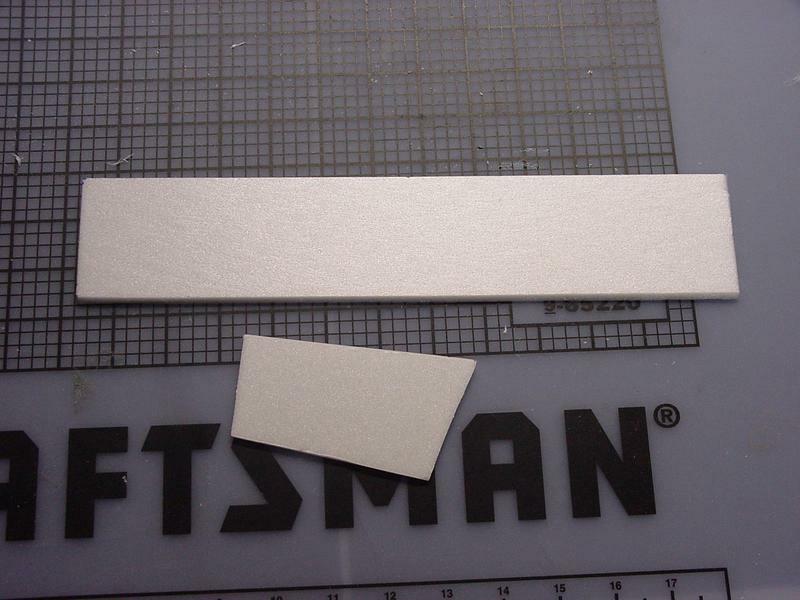 2: Cut the main fuselage part from the 6mm Depron sheet with a cutter. 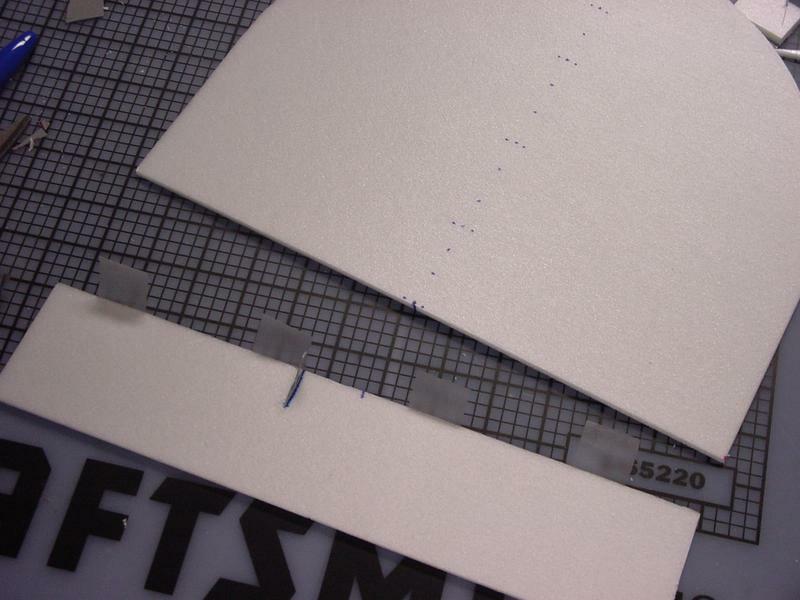 3: Cut the half-wing template from the plan, and use it to cut the wing from the 3mm Depron sheet (cut the left half, then flip the template to cut the right half). 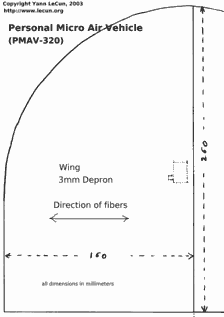 Make sure the fibers of the Depron are aligned as indicated on the plan. on the 6mm Depron sheet. 4: Sand the trailing edge of the tail fin. 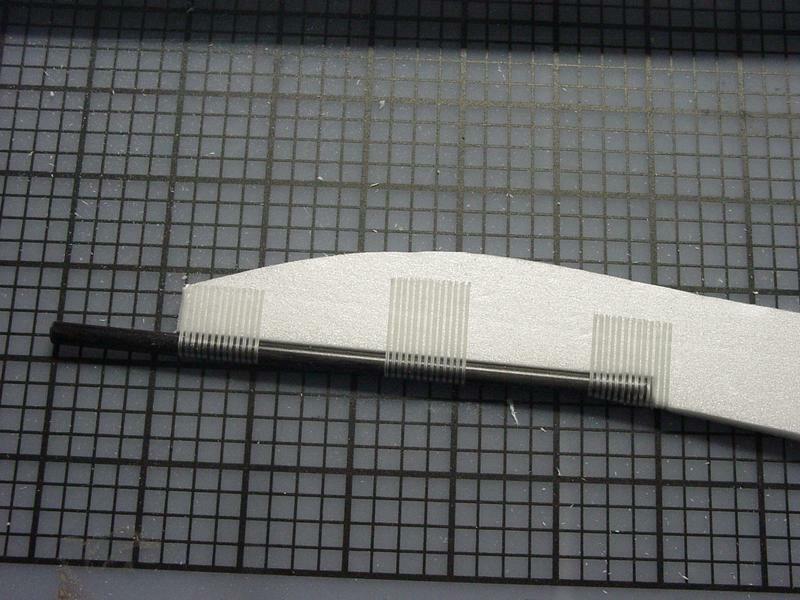 5: Get the 6mm carbon tube (150mm in length) and assemble it with the fuselage using fiber-reinforced tape as shown on the picture. 6-a: Step 6-a to 6-d are optional (though highly recommended). They will allow us to mount the propeller to the motor with rubber bands. This will avoid damaging the propeller in case of a high-speed crash. 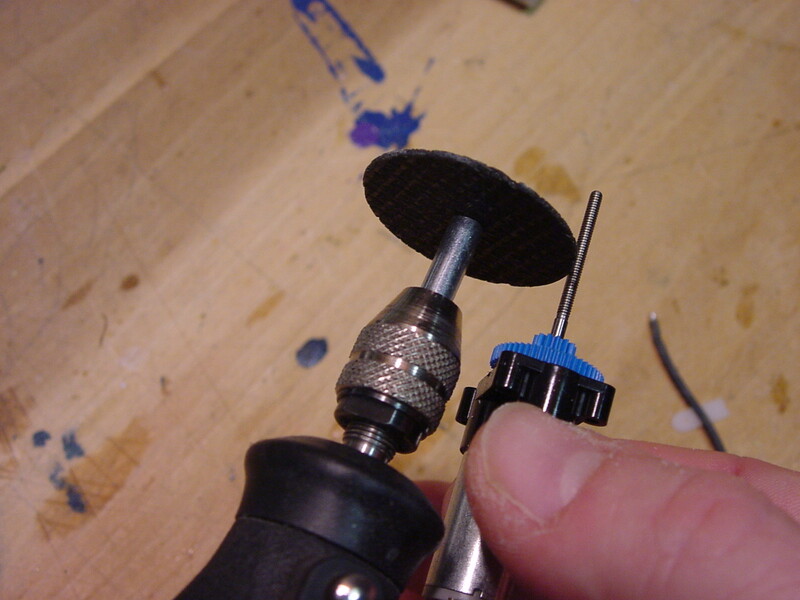 Shorten the prop shaft of the propulsion system using a Dremel cutting disc, or a metal saw, or a heavy-duty wire cutter. 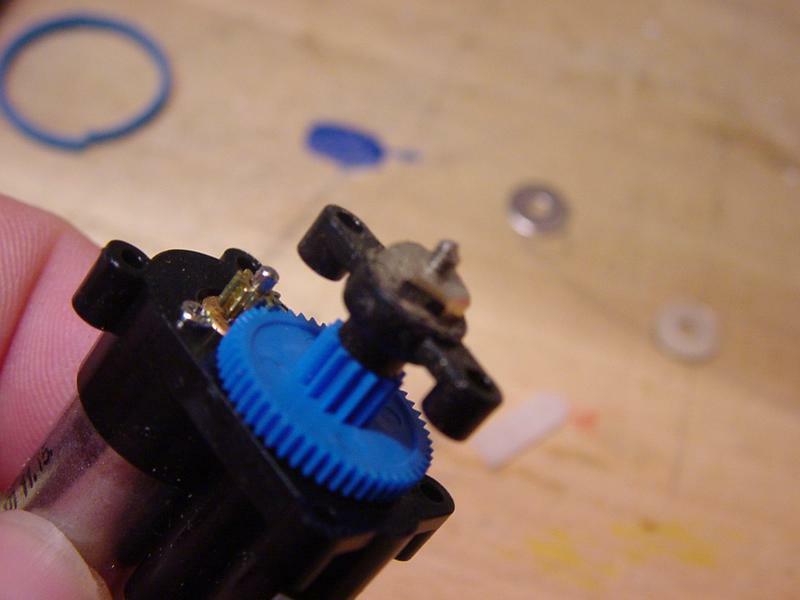 6-b: Put the GWS prop saver on the shaft and hold it with the hex nut provided with the motor. 6-c: Put the second nut on the shaft and tighten it against the fist nut (hold the second nuts with pliers and rotate the prop saver). 6-d: Sand the edges of the second nut so that the propeller will easily lock on to the nut and easily pop out. 7: Stick a small piece of double-sided tape on the tip pf the carbon tube. Then slide the motor onto the tube. 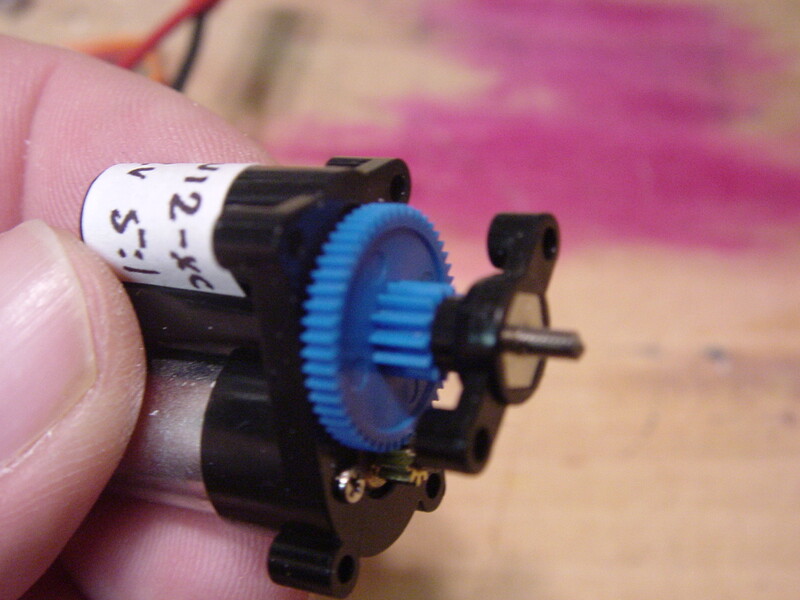 The piece of tape should create enough friction to hold the motor in place. 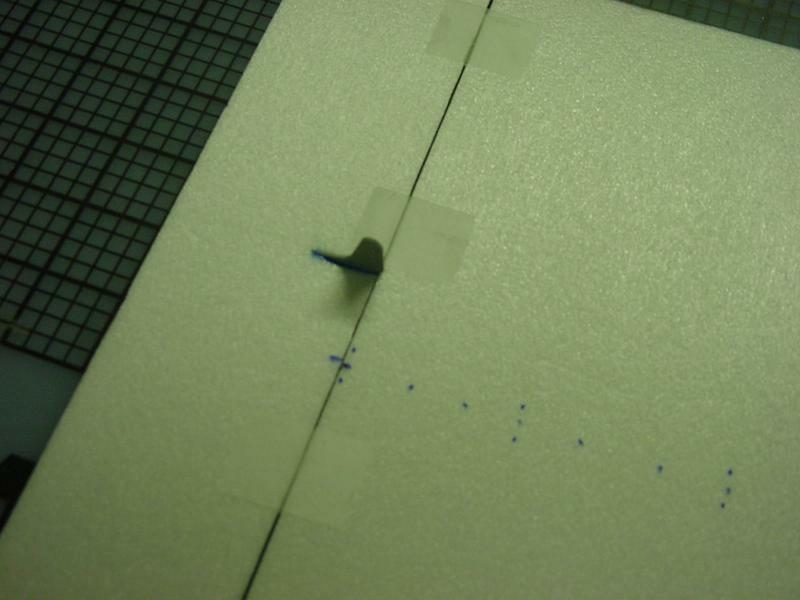 8: Cut the rudder and the elevator from the 3mm depron sheet. 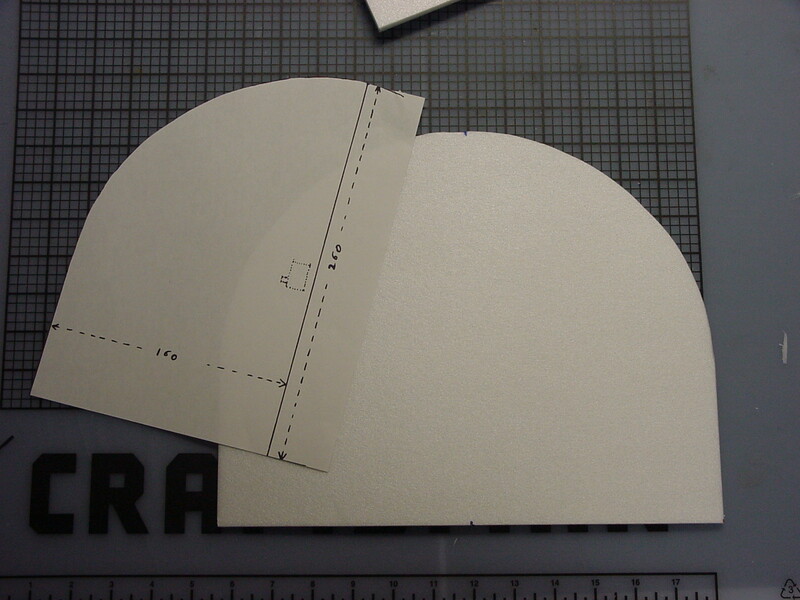 A template for the rudder is provided with the plan. The elevator is a 320mm by 60mm rectangle. 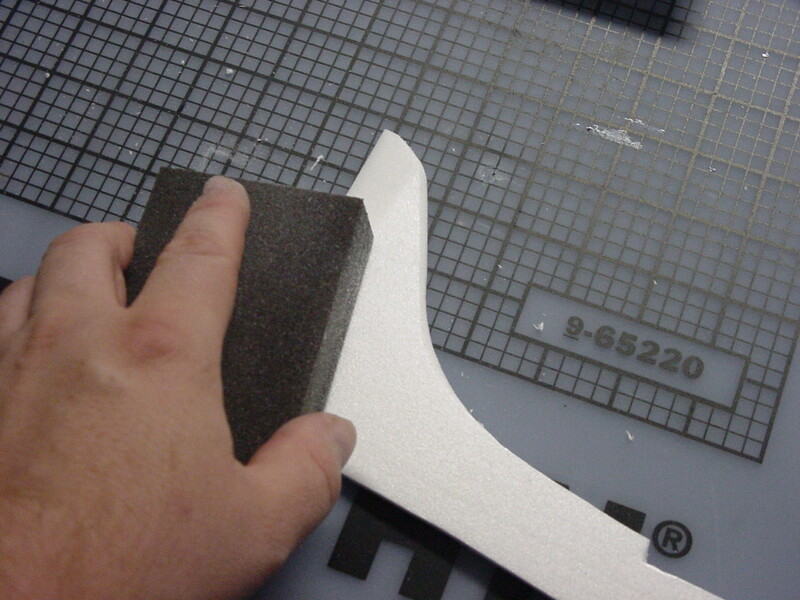 9: Cut the control horns from the 1mm plastic sheet (ABS or styrene sheets can be found at any hobby store). 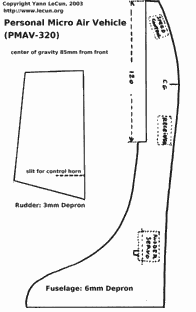 The rudder horn should be about 21mm high, and the elevator horn about 25mm. 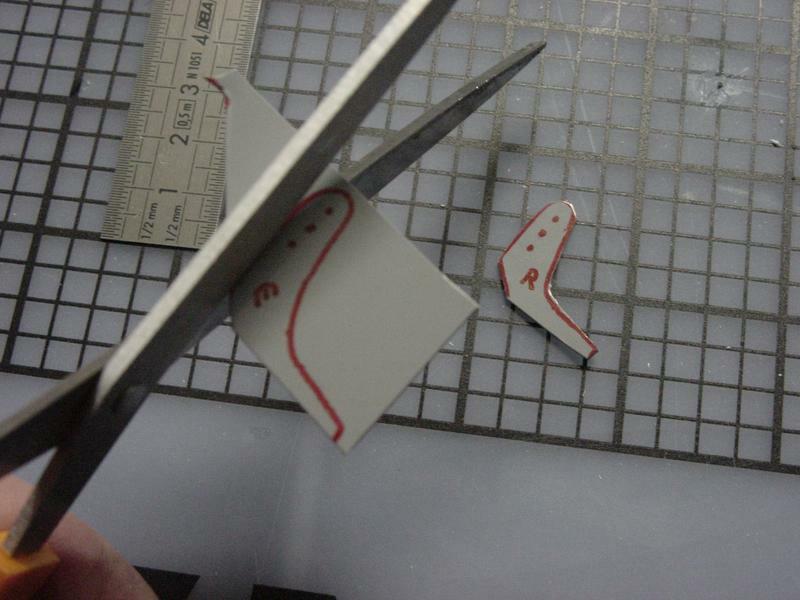 10: The plastic sheet can be cut with scissors. Drill holes in the horns as indicated. I drilled with a 1mm drill bit so that the 0.8mm music wire can easily fit. Use whatever size is appropriate for the diameter of the music wire you happen to have. 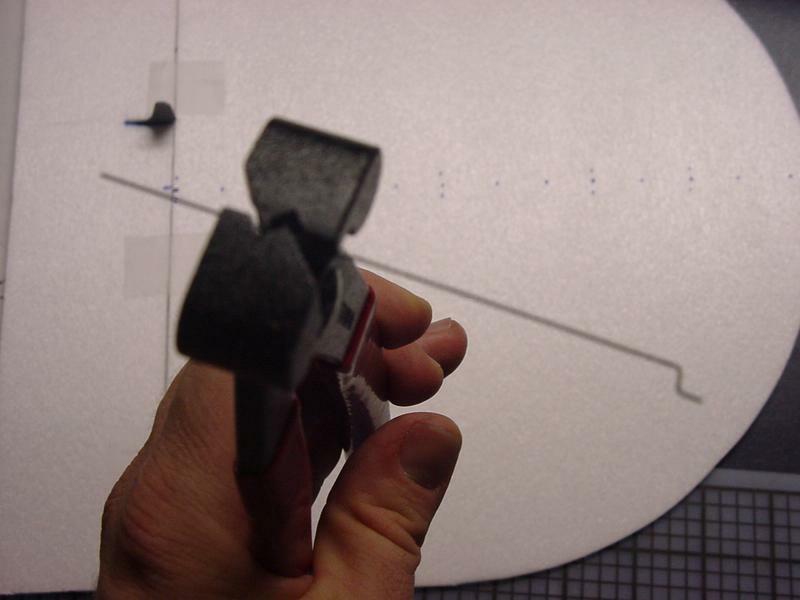 11: Cut a slit for the control horn in the leading edge of the elevator control surface, about 30mm from the center as shown. 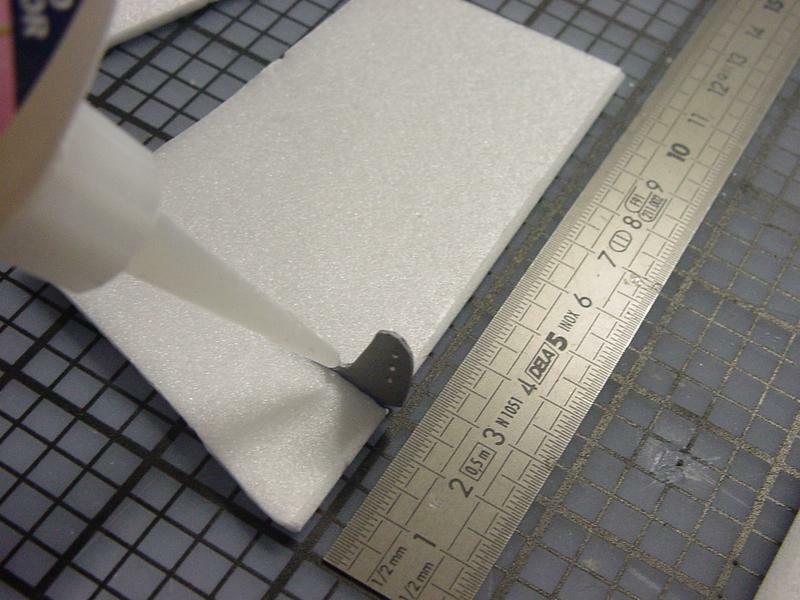 You can either glue the horn with foam-friendly CA glue (also called "odorless Cyanoacrylate glue". Regular CA glue melts Depron) as shown, or you can stick a piece of double-sided tape on each side of the horn and slide it in place. 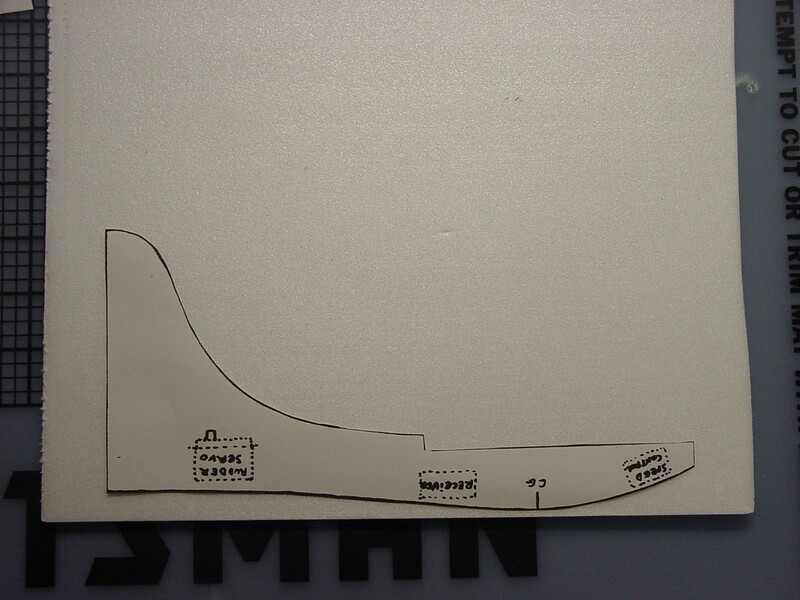 12: Cut a slit for the control horn in the leading edge of the rudder as indicated on the plan. As with the elevator horn, you can either glue it with foam-friendly CA glue, or stick it with a piece of double-sided tape on each side. 13-b: Use 4 hinges for the elevator. Start with the tape on the opposite side of the control horn. 13-c: Assemble the to parts, and put the pieces of tape on the opposite side. 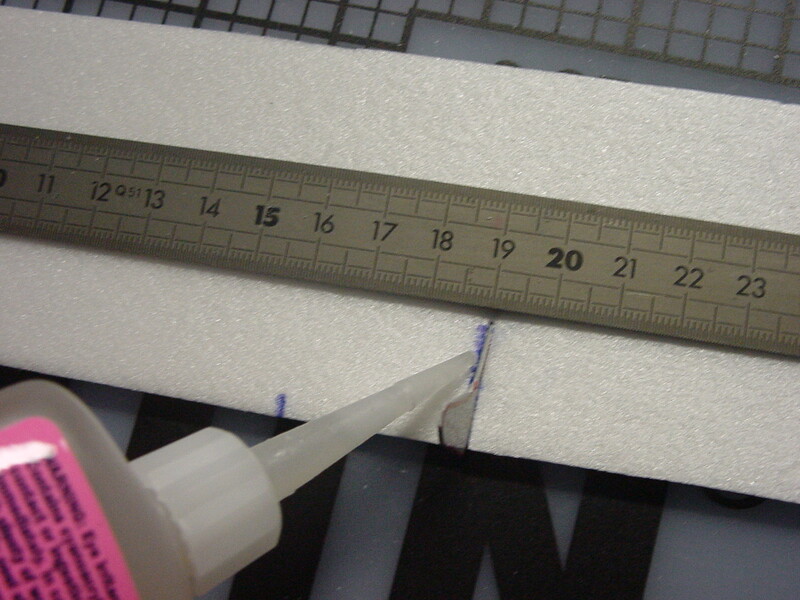 14: Repeat with the rudder (make two hinges). 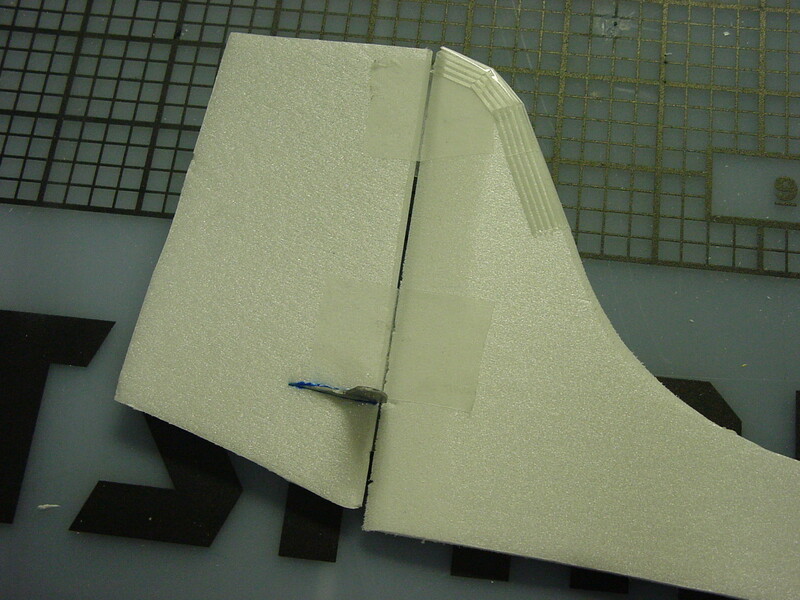 Reinforce the tip of the tail fin with fiber-reinforced tape as shown. 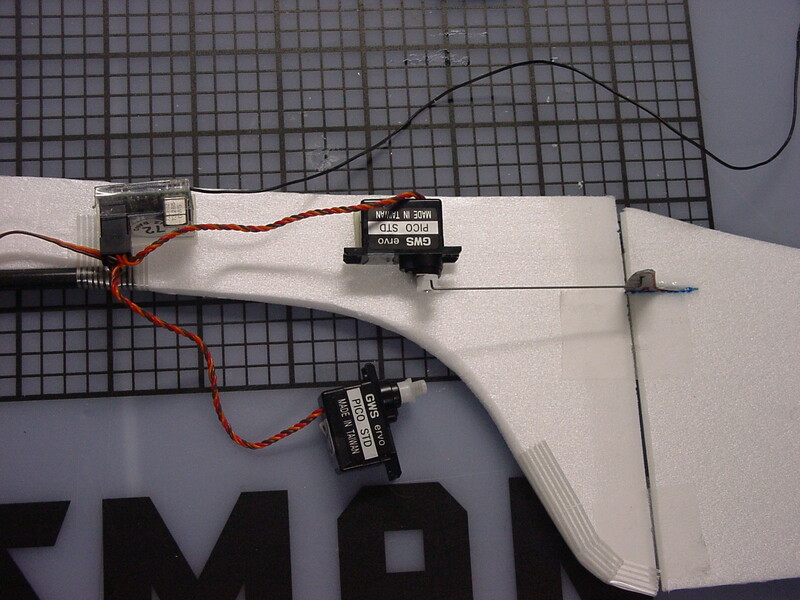 15: Connect the rudder servo to channel 1 of the receiver, the elevator servo to channel 2, and the speed control to channel 3. Turn on your transmitter, and connect the battery. Make sure the rudder and elevator sticks and trims are in the neutral positions. 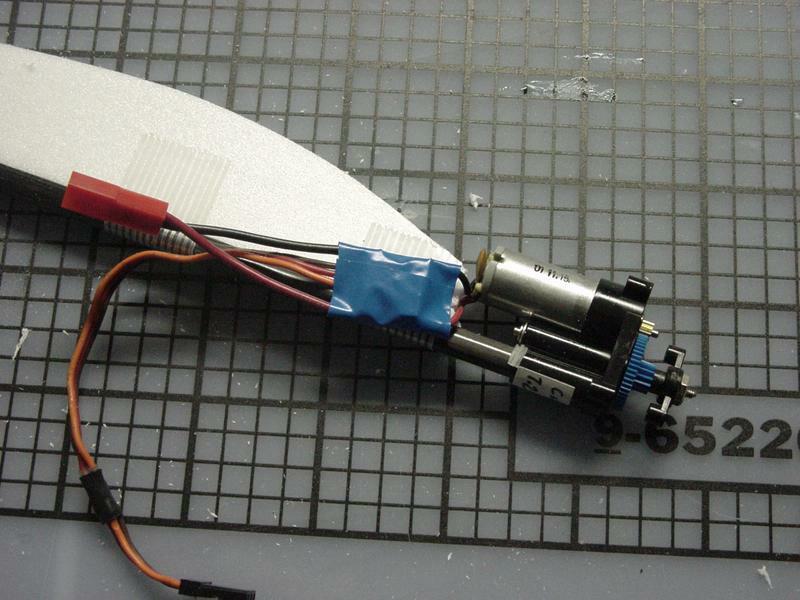 Now that the servos are in their central position, disconnect the battery. 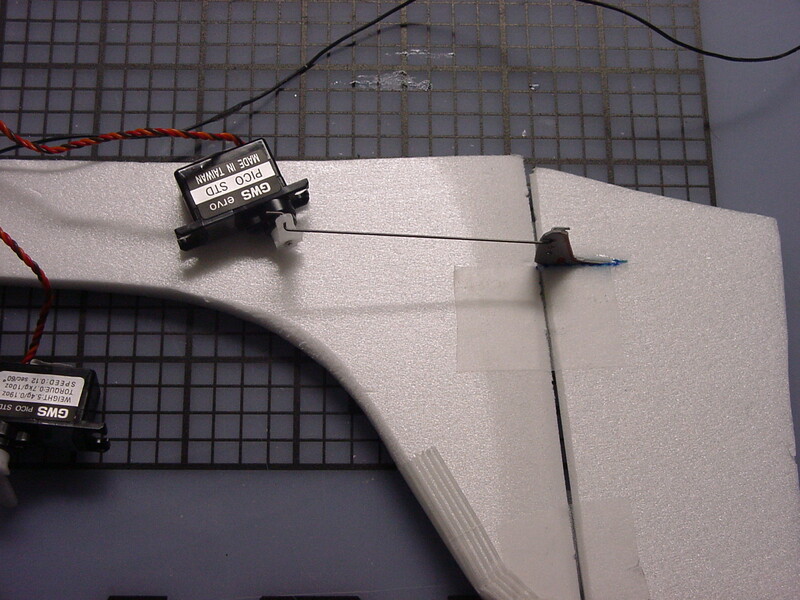 Adjust the position of the control horns on the servos so that they form a 90 degree angle with the body of the servo. 16: Make the rudder control rod with the short piece of 0.8mm music wire. 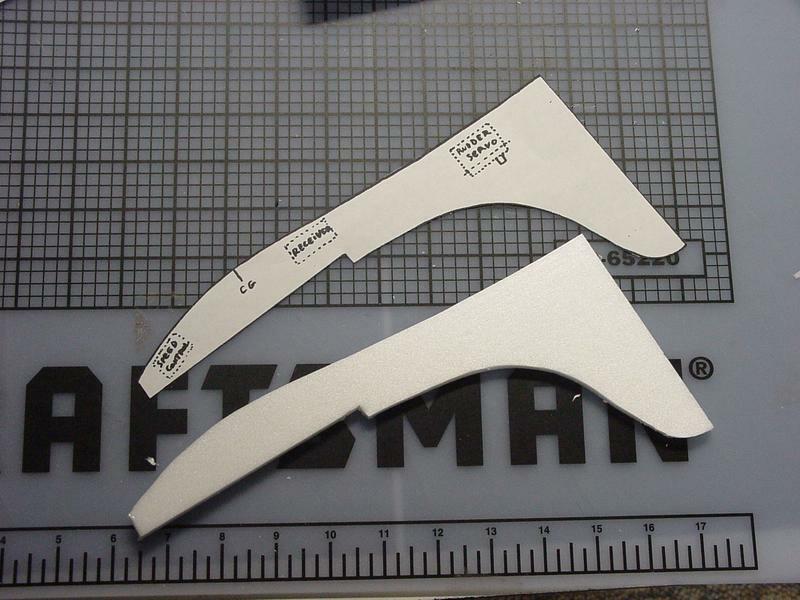 Using Z-bend pliers (or with long-nose pliers if you don't have Z-bend pliers), make two Z-shaped bends, approximately 70mm apart. 17: Place the control rod on the outer-most hole on the rudder control rod, and in the outer-most hole on the servo horn (expert pilot) or the second outer-most hole (beginner or intermediate pilot). 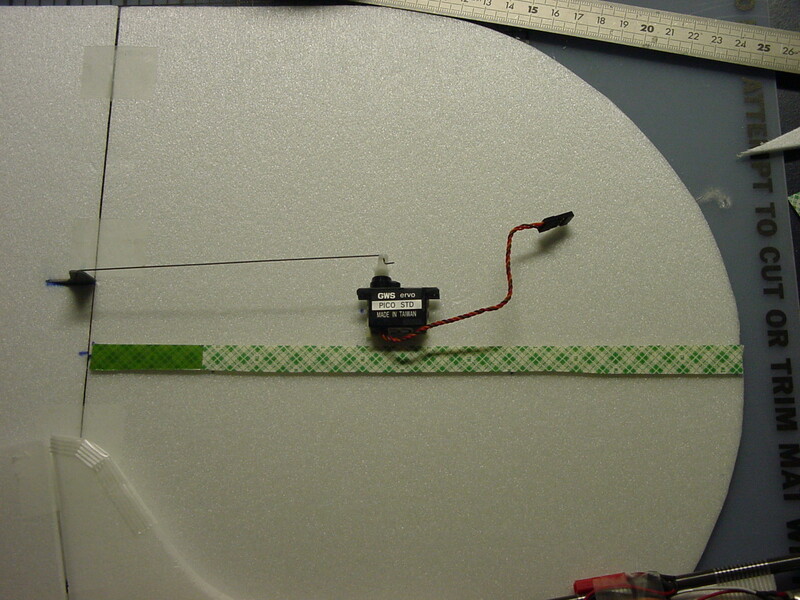 18: Place a piece of double-sided mounting tape on the servo. Stick the servo in place, making sure that the rudder is aligned with the fuselage. 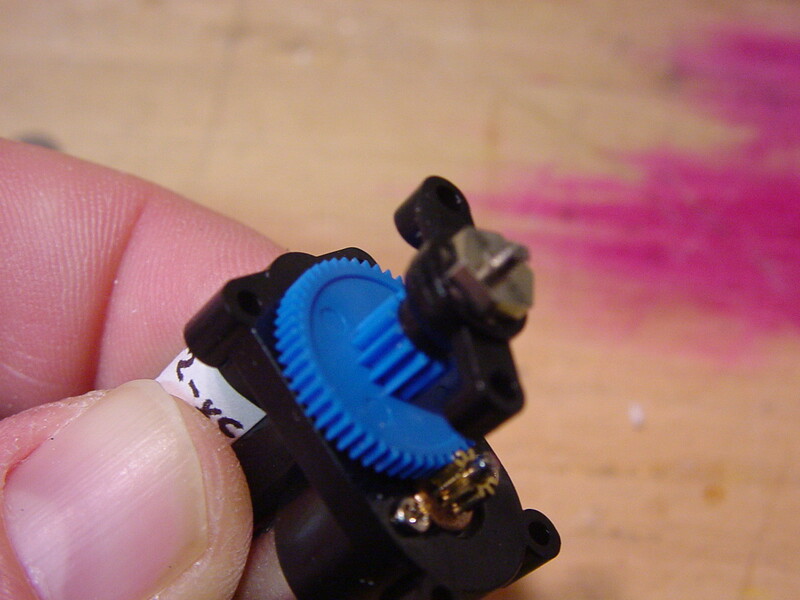 19: Repeat steps 16 to 18 for the elevator servo. The distance between the two Z-bends for the elevator control rod should be approximately 125mm. 20: Stick a piece of double-sided mounting tape along the centerline of the wing. 21: Stick the fuselage onto the tap, making sure the camber of the wing is symmetric on the left and right sides. 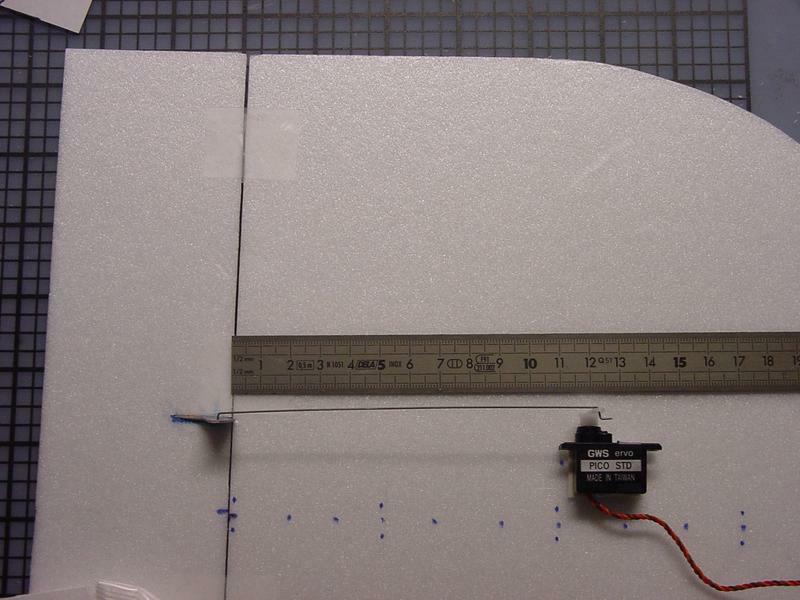 22: Stick the receiver to the side of the fuselage with mounting tape. 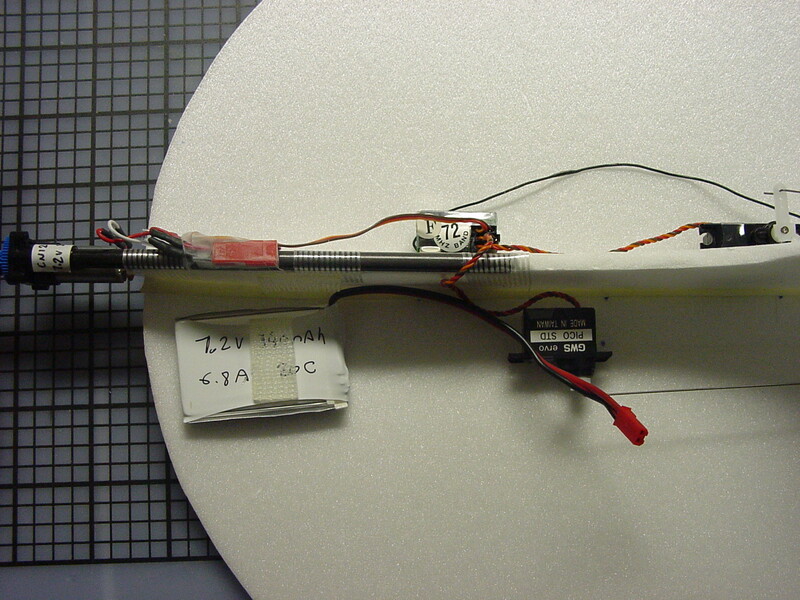 Place a piece of 3M DuraLock on the fuselage, approximately 30mm from the front, and another piece on the battery pack. If you can't get any DuraLock from your local hardware store, use a piece of Velcro. The center of gravity should be approximately 85mm from the front of the wing. If necessary, the position of the CG can be adjusted by modifying the position of the battery. That's it. Your PMAV is ready to fly. 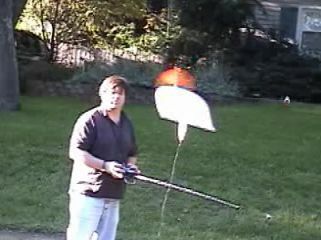 With the 6050 prop, the PMAV is very gentle and can be flown by just about anyone. The plane is so light that even a full speed crash in a hard surface will not cause any damage (assuming the "prop saver" option was implemented). With the 8043 prop, the flight is a lot snappier. 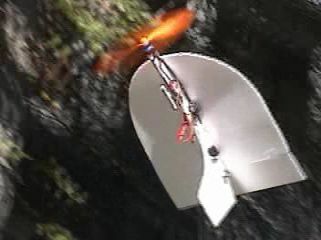 It becomes possible to fly around at very low speed with a "nose up" attitude (high angle of attack). With the 9047 prop, it is possible to take off vertically. Just put the PMAV on the ground, and apply full power. 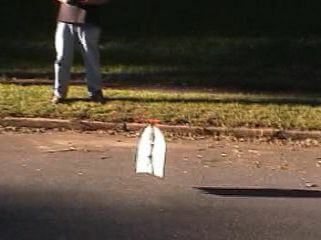 The PMAV will take off, and rotate around a vertical axis (1/2 turn to a full turn). The nose will then come down by itself. These videos demonstrate the extreme maneuverability, huge speed range, and sturdiness of the PMAV. 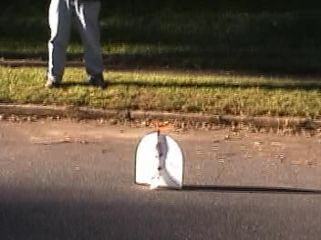 Most videos were shot in the street and front yard of a typical suburban home with lots of obstacles around (trees, cars, telephone poles, cables, intrigued neighbors,...). 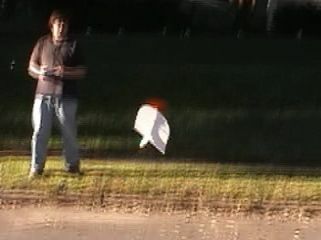 mav01-ronan01.mpg [5375KB]: a 14 year old flying the plane at a park.